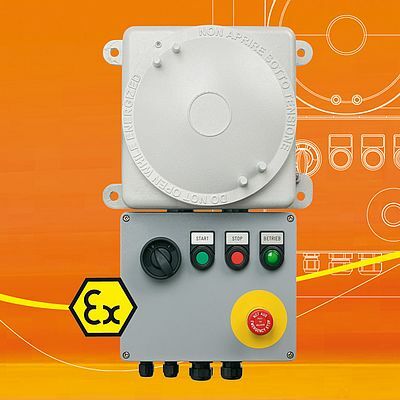 BARTEC is systematically expanding its range in the field of customer-specific control panels and is now offering motor controls as a standard solution. The compact devices are available at short notice and consist of an enclosure in the “flameproof” type of protection and a junction box in the “increased safety” type of protection. The motor control units are supplied with a main switch and control elements. The standard design with control transformer meets the requirements of EN 60204. However, the motor controls can also be ordered without the control transformer, main switch, and control elements. Other standard solutions will follow in the coming months. The expert team who constructs the controls designs and manufactures equipment for the worldwide use in potentially explosive atmospheres.